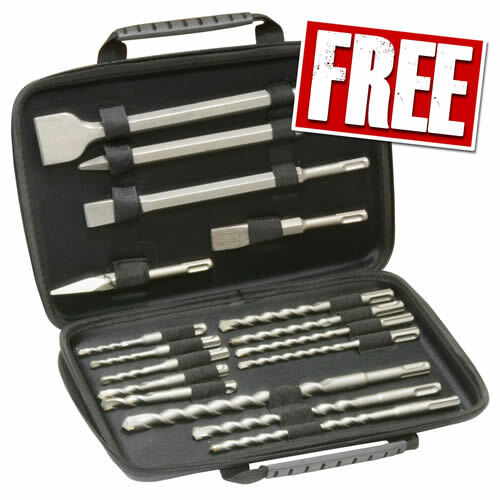 SDS+ Accessory set including a selection of drill bits plus 2 x points, 2 x chisels and 1 x bolster. 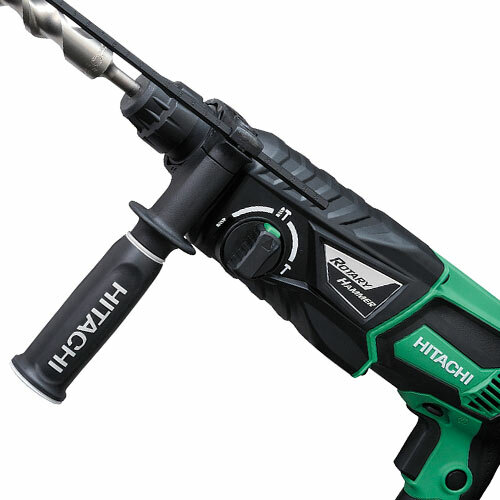 The all new Hitachi DH26PX SDS+ rotary hammer drill really is in a class of its own. 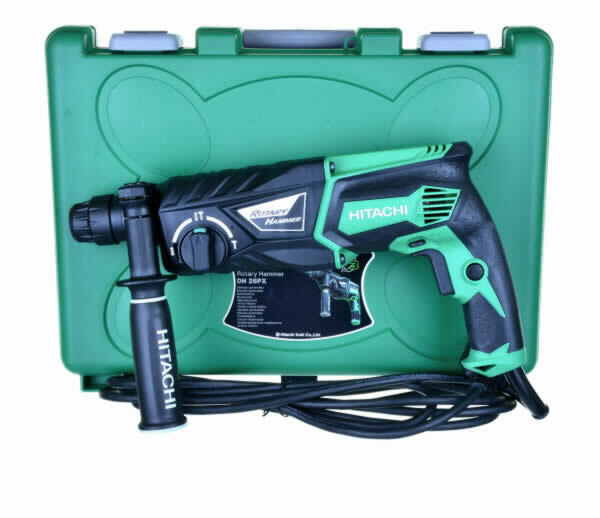 The DH26PX SDS+ rotary hammer drill boasts a powerful 830w motor, electronic variable speed control producing a max no load speed of 0-1100/min, 3 operation modes rotary, rotary hammer & chiselling action provide flexibility, creating an impressive 3.2J impact energy and max impact rate of 0-4300/min making light work of chasing and chiselling, drilling up to 13mm into metal, 32mm into wood and 26mm into concrete making it the ideal machine for multiple applications. Equipped with a one push action lock bit receptor system for quick and easy bit replacement, push button reverse switch and mode selector dial for simple and efficient transitioning between modes, lock-on speed button allowing continuous operation reducing fatigue. Low vibration design with double moulded side handle increases user comfort, whilst the angle adjustment function allows easy alignment of the chisel blades fot the perfect working position. Safety features include a mechanical safety clutch reduces the risk of injury by slowing the speed of the machine once the trigger has been depressed, protecting the motor from rapid burn-out, further enhanced with a magnesium alloy gearbox housing helping sustain the life of the machine and replaceable carbon brushes for an added advantage. The lightweight, compact 2.8kg design doesn’t compromise usability for power, with the ergonomic, soft-grip handle and gear casing for increased comfort on the job reducing hand fatigue and a removable side handle with depth gauge ensures an accurate drilling depth and greater control. 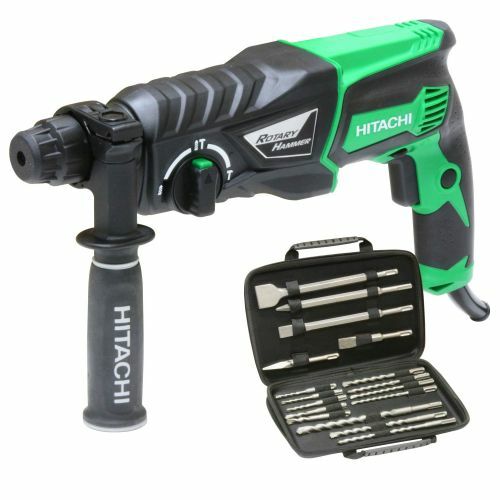 Hitachi 3 Year Extended Warranty. FREE product registration required otherwise standard 1 Year applies. (more information will be supplied with your product). Standard 1 year applies to batteries and chargers. "Not a bad little drill but not able to compete with the better brands, I owned two dh26px drills the hammer is too strong for the drill housing and inner motor I found out at my own cost thinking someone had broken it by being careless but it was using the hammer action that broke both drill, the dh26px is way overpriced at over a ton plus vat in all honesty it is a �60-�70 Inc vat drill." "Best 2kg sds on the market. I've tried deWalt bosch and makita and this one wins hands down got them on all the vans now wouldn't use anything else "
"Won't find it cheaper anywhere else Brilliant value for money! Use mine mine for drilling into concrete never let me down! "